14kTT flower diamonds pendant, 0.4160 ct of diamonds,with a cable 18"chain with a lobster claw clasp. A posh pendant of pleasing beauty! 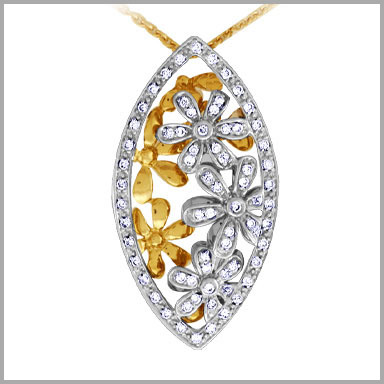 Crafted in polished 14K white, and yellow gold, this pendant features a total of 67 round cut diamonds in bead setting. They make up three white flowers shaped sections ,it also features some yellow gold flowers The total diamond weight is approximately 0.4160ct. It measures 5/8"x 1-1/4".The color is G-H and the clarity for both is SI.